Trafalgar Square Books caught up with Linda Snow McLoon, author of an all-new fiction series for young horse lovers: THE BROOKMEADE YOUNG RIDERS SERIES. Crown Prince and its follow-up, Crown Prince Challenged, star an off-the-track Thoroughbred named Crown Prince and a group of young riders who are best friends, jealous rivals, and aspiring competitors at Brookmeade Farm. We asked Linda about the source of her inspiration, her own experience with ex-racehorses, and to share some of the books she loved to read as a little girl. CROWN PRINCE and CROWN PRINCE CHALLENGED are available now from the TSB online bookstore, where shipping in the US is always FREE. TSB: Can you tell us how you came up with the idea for Crown Prince and Crown Prince Challenged? LSM: As a girl, I wanted a horse more than anything, and this led me to write the story of a girl who struggled to have a horse of her own. When I sat down at the keyboard, the Crown Prince Ouija took over, leading me to the adventures of Sarah Wagner and Crown Prince. TSB: Have you always written fiction geared toward young adults? What precipitated this foray into writing for this age group? LSM: I choose to write stories for all those young adults who dearly love horses. TSB: Did you have a “Crown Prince” in your life? Can you tell us about the first horse that captured your heart? 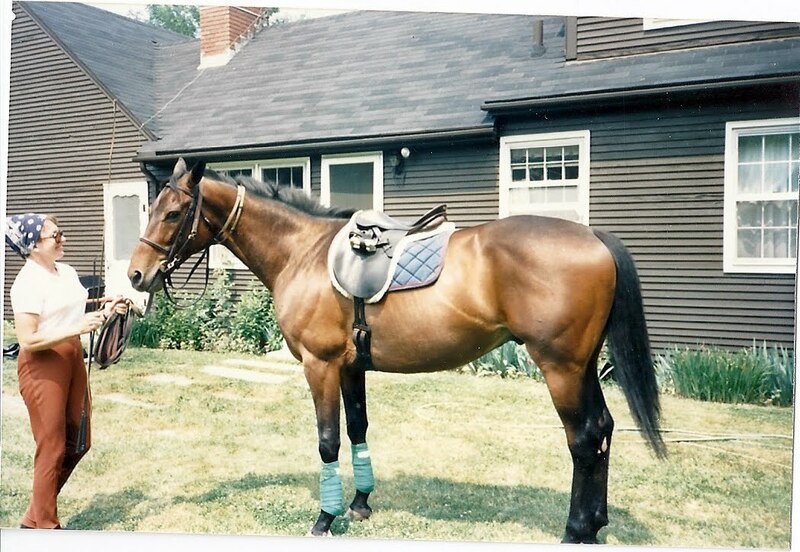 LSM: There’s always something special about one’s first horse, and for me, that was a gray Saddlebred named Clipper that I took care of and rode when he wasn’t being used in a summer camp riding program. I’ll always remember the night I went for a moonlight ride without telling my parents and ended up with a posse out searching for me. Linda Snow McLoon and the OTTB Gamekeeper. 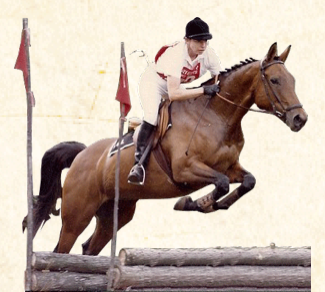 TSB: Crown Prince is an off-the-track Thoroughbred—have you worked with OTTBs and if so, how did you come to make retired racehorses part of your horse life? LSM: I’ve always loved the athleticism and sensitivity of Thoroughbred horses, and over the years, I became foster mom for many OTTBs that were beginning a new career as sport horses after racing. It always gave me a great deal of pleasure to help them make the transition. TSB: What is it that you think readers will most identify with in terms of Sarah’s life and experiences with Crown Prince and the Young Riders? LSM: Readers will immediately sense the deep bond between Sarah and Crown Prince. Any reader who has longed for a horse of her own will understand Sarah’s love for Crown Prince and cheer as she fights to make him her own. TSB: What was your favorite horse book as a little girl? As a teenager? LSM: From the time I began reading horse books, I was a huge fan of Walter Farley and his Black Stallion books. I also enjoyed Marguerite Henry’s books with their wonderful illustrations by Wesley Dennis, especially King of the Wind and Album of Horses. LSM: It would be a Thoroughbred, and I never tire of reading books by the master, Walter Farley. When I was in high school, I and a friend visited him at his family’s beach house in Venice, Florida. He was a gracious host. LSM: Plenty of carrots – just in case! LSM: Being close to a horse and watching his eyes soften and wrinkle in the corners as I stroke and talk softly to him. LSM: My parents were visiting friends who had horses. My sister and I got to sit on them as they were led around a riding ring. LSM: A horse I was riding bucked when it was stung by a bee. I remember someone saying that I looked very graceful as I floated to earth. LSM: Like the Brookmeade Young Riders Series characters Sarah and Kayla, the ability to talk to each other about anything and everything. LSM: I love horses that have a quality I’ll call “class,” which gives them high intelligence along with an easy-going disposition. Crown Prince is well-endowed with class! LSM: To gallop down a hard-packed beach close to the white-capped surf with gulls swooping down – as Sarah does with Crown Prince in the second book in the series. LSM: Sitting around the table with family and good friends, regardless of what’s on the menu. LSM: To ride horseback in a place with a significant historical connection, such as when I rode down England’s Wenlock Edge. Legend has it that a Royalist officer in the English Civil War, when pursued by Cromwell’s army, galloped his horse down the Wenlock Edge and lived to tell about it. LSM: Moderation in all things. And check out cover artist Jennifer Brandon’s equestrian and canine paintings and portraits!